Participants in the WTF International Referee Training Camp for the 2008 Beijing Olympic Games practice scoring at a gymnasium at Woosuk University in Jeonju, North Jeolla Province, in Korea on the second day of the week-long education program on July 30, 2007. 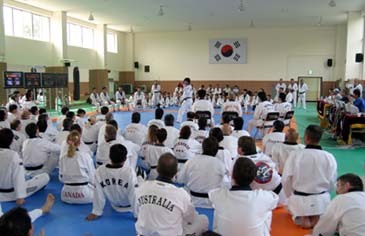 A training camp to select international referees for the taekwondo competition of the 2008 Beijing Olympic Games kicked off at Woosuk University in Jeonju, North Jeolla Province in Korea, on July 29, 2007. The week-long WTF-organized training camp, which is scheduled to continue until Aug. 4, drew a total of 187 international referees from 57 countries. Through the intensive training session, which serves as the first stage of screening, the WTF will rank all the participating international referees. For the second stage of the screening, the WTF will send highly ranked referees to the World Taekwondo Qualification Tournament for the 2008 Beijing Olympic Games in Manchester, United Kingdom, in late September this year, and the WTF's five continental qualification tournaments. The African Taekwondo Qualification Tournament for the 2008 Beijing Olympic Games is scheduled for Nov. 1-3 this year in Tripoli, Libya. The Asian Qualification Tournament is slated for Nov. 29-Dec. 2 in Ho Chi Minh City, Vietnam; the Pan-American Qualification Tournament on Dec. 7-9 in Cali, Colombia; the Oceania Qualification Tournament in late December in New Caledonia; and the European Qualification Tournament on Jan. 26-27, 2008, in Istanbul, Turkey. By early February next year, the WTF is to announce the final 29 international referees, who will officiate at the taekwondo competition of the 2008 Beijing Olympic Games. "We organized this week-long, intensive referee selection training camp as part of our efforts to ensure fair and transparent selection of international referees for the 2008 Beijing Olympic Games," said WTF President Chungwon Choue. For the first time in the WTF's referee education programs, the training camp conducts basic medical checkups, such as visual acuity, colorblindness, blood pressure and hearing, and fitness tests, like 1,200-meter run, 50-meter sprint and standing long jump. For the evaluation of practical tests, the WTF set up an eight-member ad-hoc evaluation committee.